At Ben & Nino Towing and Auto Repair, we’ve got you covered for all your car service needs. We offer many services from 24-hour towing, roadside help, and emergency assistance. You can count on us for excellent service in Greenpoint, Brooklyn. Our towing service includes many features that will help you out, for all your towing needs. We offer our towing service all hours of the day. We also give emergency roadside assistance. That includes battery jumpstart, flat tire changeout, cat lockout services, fuel delivery, motorcycle towing service, blocked driveway towing, and junk car removal. In Greenpoint, Brooklyn, you won’t be able to find a better towing service. We work hard to ensure that our customers have a smooth experience while working with us. Because of our attention to detail, we have earned the respect of many residents in Greenpoint, Brooklyn. We have a strong reputation with our customer base. We are trusted by our clients and that’s what keeps them coming back again and again. Our mechanics are ASE certified. They have a seal of excellence from the National Institute for Automotive Service Excellence. What does that mean for you? Our mechanics know what they are doing when they help you tow your car, change your tire, or any other service you ask for. 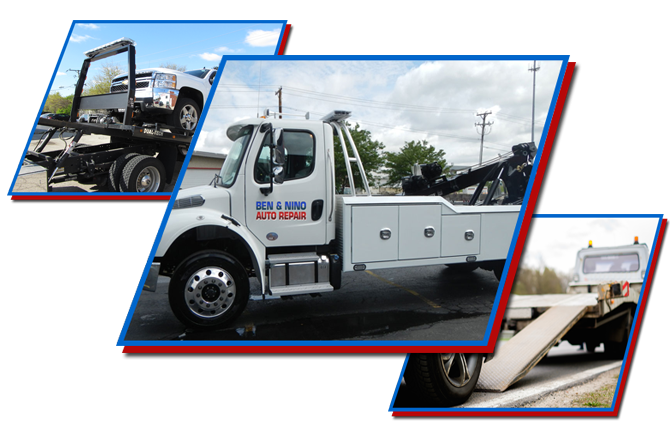 With our large fleet of tow trucks ready to go, call Ben & Nino Towing and Auto Repair today for your towing and auto repair needs.